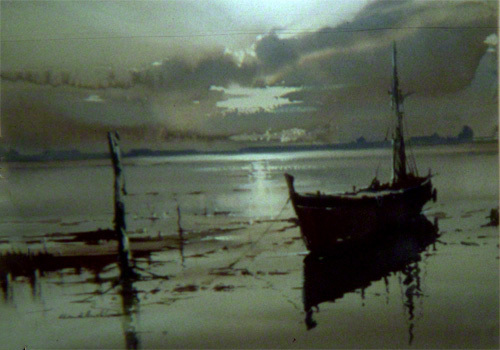 A water colour painting by Claude buckle showing a river estuary with a boat and in the distance the sun going down on the horizon. The painting is tinged with golds to represent the title "Sundown". A typical Buckle painting showing a boat as the main subject and the sky with the sun reflection in the distance. A mooring post stands to the left of the boat in order to balance the picture. A very high quality water colour painting. Courtesy Barbara Buckle. Created in 1970.